About: Now part of the Geronimo chain, the Northcote is a pub that serves a variety of beers, wines and spirits as well as a superb gastro-menu. "Delectable menu with a Victorian favourite and retro desserts"
Being a North Londoner, I suffer from extreme disorientation whenever I find myself south of the river. There is something about a metropolitan area that relies mostly on overground trains for transport that fills me with suspicion. In any case, to soothe my south London niggles I take the scenic route to Battersea via a bus boarded by Trafalgar Square. Once over the river I am totally lost, until I see a sign for Battersea Arts Centre and I breathe a sigh of relief. 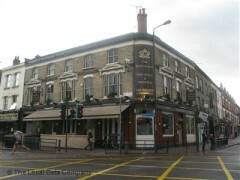 I step off opposite Clapham Junction and make my way to The Northcote, a pub run by the Geronimo Inn chain. Geronimo own over 20 pubs in London, and business is clearly booming as The Northcote is teeming with people when I walk in. Squares dominate the décor of this busy pub, they’re everywhere: adorning the columns that sit in the middle of the room, the tables, and the floor by the bar. It’s a chess-lover’s dream. The kitchen had just run out of sardines, so we ask for devilled kidneys on toast (£5.50) instead. This dish was a popular breakfast choice in Victorian times, however the slightly spicy aftertaste makes me think it’s more suited as a starter for a meal later in the day. The deep-fried ham hock, potato and cheddar croquettes (£5.50) come with a sweet mustard and pear pickle, which complements the rich flavour of the chubby morsels. The dressed Portland crab (£13) is fleshy and savoury, served in a crab shell and accompanied by toast and butter. The cod (£13) is flavoursome and falls apart to the touch. Whilst I can’t begin to claim being a wine connoisseur, some thought has clearly gone into the wine list, which describes the aromas and flavours of their recent additions, helping one to choose. The recommended Chilean Gran Hacienda Sauvignon (£15.90) goes down well with our fishy courses. Dessert is an indulgent and wonderfully retro knickerbocker glory (£5), with delicious layers of ice cream and blueberry jelly. With a full stomach I traipse back over to my side of town, however for pleasant meals like this it’s worth straying from my comfort zone. The worst Sunday lunch I have ever (partly) consumed. Brings cuisine back to the early 70's.